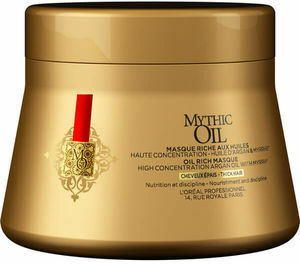 L'Oréal Professionnel Mythic Oil Masque for Normal to Fine Hair is inspired by the tradition of ancient Egyptian queens’ oil layering for healthy looking hair. The Mythic Oil Masque is concentrated with ginger essential oil, bringing tonicity and the look of vitality to the fiber. The treatment is also infused with osmanthus extract, renowned for deeply caring and providing suppleness to hair. The creamy mask makes the hair easy to comb and leaves hair looking nourished.